Lock in a great price for Abba Madrid – rated 8.5 by recent guests! The hotel is very close to the subway station. It enabled me to access everywhere I wanted to go. Hotel is modern style and clean. The staff were kind and helpful. We had a great time. Excellent ambience, ideal location and clean and spacious rooms. I had an attractive rate for 3 days I stayed in Madrid, it doesn't seem usual however to get such rates at this hotel. Location. It is at 10 mins walk from the IE university. Next to a restaurants and supermarkets. 10-15 mins from the airport and train station. Bed was super comfortable. Reaturant downstairs was very reasonably priced and tasty. Came here by chance, got surprised for the high level of the service of the hotel Cleanningness, customer service, laundry service (super fast and helpful!) Amazing view! Too many great details to enjoy! Good breakfast, good and quite cheap drinks in the bar, very comfortable, a lot of complementaries in the bathroom. Abba Madrid This rating is a reflection of how the property compares to the industry standard when it comes to price, facilities and services available. It's based on a self-evaluation by the property. Use this rating to help choose your stay! The Abba Madrid is located in Madrid’s Salamanca district, just 150 feet from Cartagena Metro Station. This stylish hotel features a restaurant with Mediterranean and market cuisine, and comfortable rooms with free WiFi. 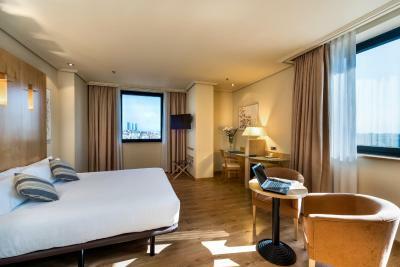 Abba Madrid Hotel offers simple décor with bright colors, carpeted floors and wooden finishings. Each air-conditioned room is soundproofed and has a mini-bar, satellite TV, and fully equipped bathroom with amenities. Guests can enjoy a buffet breakfast in the hotel dining room. There is also a bar and lounge area. 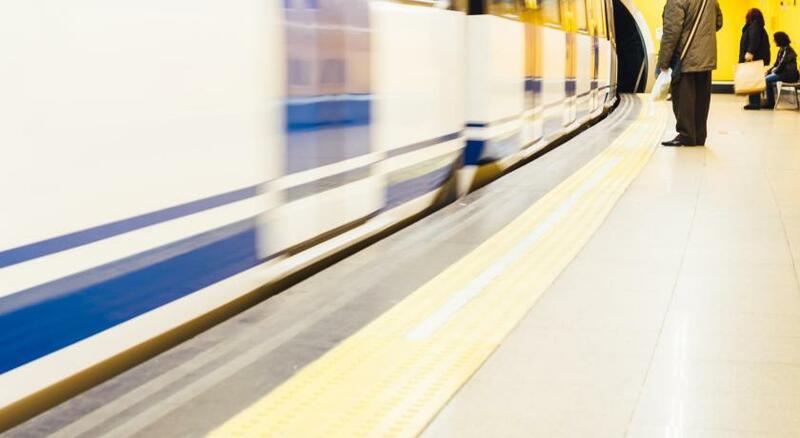 The hotel is ideally located for visiting Madrid’s many attractions, including the Prado and Reina Sofia museums, which can be reached in 20 minutes by Metro. The number 200 bus to Barajas Airport stops outside the hotel, on Avenida de América. 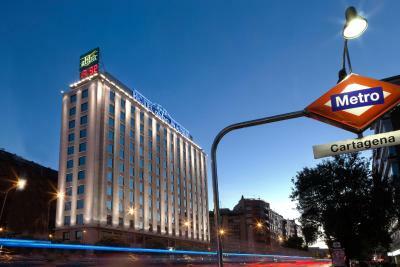 When would you like to stay at Abba Madrid? This bright, air-conditioned room features satellite TV, free Wi-Fi, soundproofing and a private bathroom. This spacious room includes an armchair and a modern bathroom with a bathrobe. It comes with free WiFi. This bright, air-conditioned room features satellite TV, soundproofing and a private bathroom. It comes with free Wi-Fi. The third bed is a folding bed. This room type consists of 2 interconnecting rooms, one with a king bed, the other with twin beds. It comes with free Wi-Fi. This spacious room features a private balcony with a table and chairs. There is also a work desk. It comes with free Wi-Fi. The third bed is a folding bed. House Rules Abba Madrid takes special requests – add in the next step! Abba Madrid accepts these cards and reserves the right to temporarily hold an amount prior to arrival. The hotel reserves the right to request advance payment at check in. Guests are kindly requested to indicate the total number of people staying in the room using the Special Requests Box during booking. Please note that car parking spaces cannot be booked in advance. There was no kettle in the room for an evening or morning beverage. The semi-connected double beds for couples belong in the last century; and the shower needs to bigger than a phone booth. Everything was better than expected! Wish they were cheaper so I can have more nights there whenever I came for work! AIr condition was pretty loud. We had to change rooms 3 times. First one smelled really bad (toilet pipes problem kind of smell). In thé second one someone had been smoking and the smell was also awful (it was a non smoking floor and room). Finally the 3rd room was OK, although there was no soap and we had to request it. Staff did their best to help us. I had to move room 3 times due to the rooms being unclean. Stains all over the carpets, rotten smells and windows that did not close properly. Location. Staff very friendly and helpful. Comfortable beds. Lovely views. The menu del día was overpriced. There was not a great amount of alternative places to eat or drink in the area. The hotel was spotlessly clean, light and comfortable. The bedroom was large and the beds were comfortable. It was designed for maximum quiet. The bathroom was luxurious. The staff were friendly and helpful. It was a little bit hot for me in room. Other small things were solved immediately. Nice and comfortable hotel with plenty space in room and bathroom. Breakfast was tasty with good choice of food. Away from center but good location for connection with airport by bus. Excellent location.Metro station.just outside the hotel. Very clean and spacious rooms and hotel public areas. Very nice and quiet area. Friendly staff.